The identification of components presents a number of challenges and Dantech can supply labels and plates which can be used in demanding conditions with high temperatures and chemicals present. Barcoding in a manufacturing environment will help manufacturers take control of their processes and ultimately reduce production cost considerably. By simplifying the process with user-friendly technology the risk of errors can be effectively minimised while at the same time increasing the efficiency of the production process and inevitably result in a positive impact on profitability. 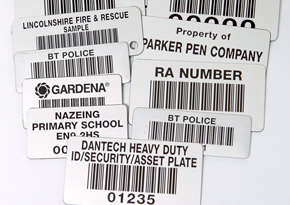 Dantech property and asset identification labels and plates have an adhesive backing for easy "peel off - press on" application and they will bond instantly and permanently to most clean, smooth and dry surfaces. Bond strength actually increases with age.